The audio version of Aalaporan Tamizhan, the first single from Mersal, released yesterday (10th August) on all the digital platforms. The song, composed by A.R.Rahman and written by Vivek, was well received by the music lovers and Thalapathy fans. Now, the team has announced that the lyric video of the same song will be out today at 7 pm. 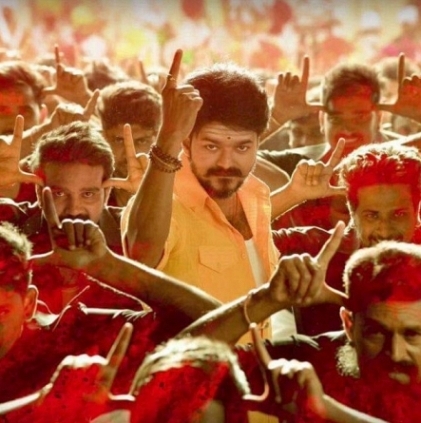 Thenandal Studios Limited tweeted, "#AalaPoraanThamizhan lyric video at 7pm! 2 hours to go! #Mersal @actorvijay @arrahman @Atlee_dir"
Can we expect some new stills from the movie through the lyric video? Let us wait and watch. Huge: A major change in the CBFC! AR Rahman to compose music for this legend’s biopic film! Just in: Priya Bhavani Shankar in Bigg Boss? Bigg Boss Oviya’s next film to release next week! Just in: Jai and Anjali’s film gets its release date! After Vivegam and Mersal, it’s now this big film! Actor Abdool Wraps Up His Dubbing Portions For Vijay And Atlee’s Mersal. Vijay Atlee's Mersal Satellite Rights Sold To Zee Tamizh. People looking for online information on Atlee, Mersal, Vijay will find this news story useful.